Accept an invitation to join the Fighters Guild. Go to the Fighters Guild in Daggerfall. Approach Basile Fenandre on the main level, who will ask you if you have you come to answer the Guildmaster's challenge. Ask about the challenge, and he tells you they have a new Guildmaster, and a new "singular purpose." The new Guildmaster is an Argonian named Sees-All-Colors and she has the guildsmen destroying the Daedra, and their Dark Anchors. If you ask him what you get in return for joining the guild, he'll tell you that they train members in special techniques. And the "higher-ups are always looking for motivated members to help with special projects. You never know when the Council will come looking for more hands." You can continue to ask him about various aspects of the guild, but if you tell him you're ready to join the guild, he will welcome you as an Associate of the Fighters Guild and instruct you to see Sees-All-Colors upstairs. This quest is only available to characters in the Daggerfall Covenant. This quest can also be obtained from a Fighters Guild Handbill located on noticeboards. 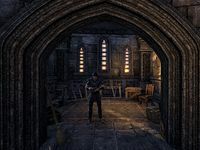 Finishes quest The Hall Steward Basile has asked I speak with him about the Fighters Guild in the Daggefall Guildhall. This page was last modified on 11 September 2018, at 02:48.